This week I have been mainly splashing cream all around my kitchen. All in the name of art you understand of course. 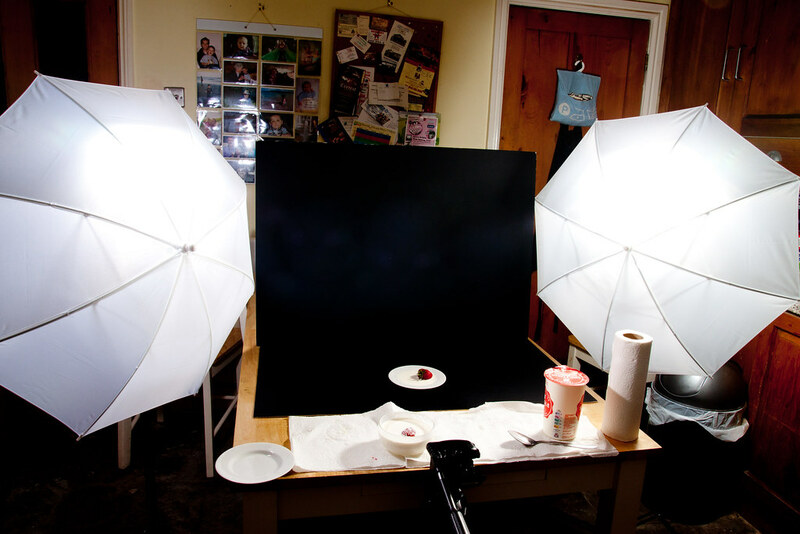 I decided to put my new flash gear into use to try to take an artistically pleasing shot of some strawberries and cream. But I didn’t want to replicate a Wimbledon-style photo but one where the strawberries were dropped into some cream causing the cream to splash across the frame. And I was reasonably successful. I set up two black picture boards as a mini studio with one lying flat on my kitchen table and the other propped up against some pots to make a good background. I placed my Canon 430EX II on a stand behind a white umbrella on camera right and my YN 560 also on a stand behind an umbrella camera left. I filled a white saucer with some single cream, placed that on the black card and dropped a strawberry onto the saucer. Using a cable release I then tried to time the camera and flashes to go off at the same time as the strawberry hit the cream (I used my PT-04 wireless flash trigger system to set off the flashes). This was harder than it sounds and I took about 30 photos where I mistimed it completely. In each case either I was too early an d the strawberry was nowhere near the cream or I was too late and missed the splash. Either way each time the strawberry hit the cream and splashed cream everywhere which caused a lot of mess! So after each shot I had to clear up – so I ended up getting very frustrated. I am a bit worried that most of my gear is now going to smell of gone off cream tomorrow…. 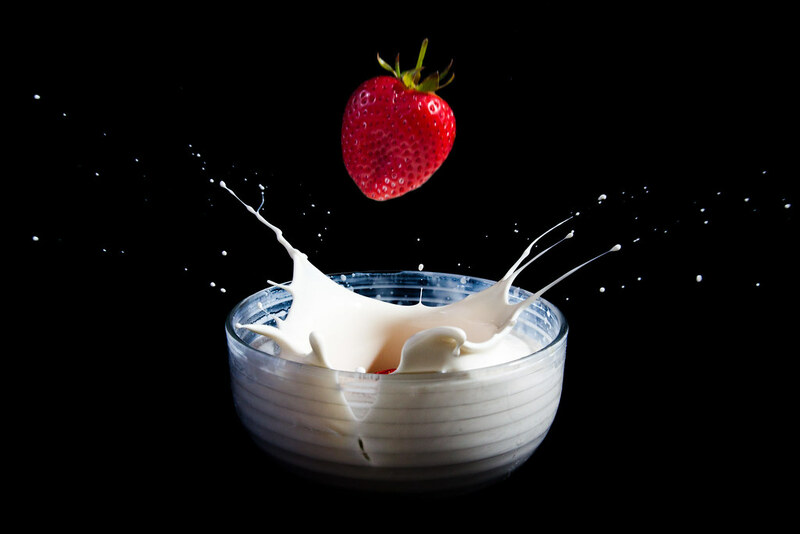 No wonder many people use a laser or sound triggering system for this sort of shot as that can be used to set off the flashes once the strawberry hits the surface of the cream. But as I don’t have such a high tech system I had to rely on a mixture of timing and luck with the latter being the most useful!. But I did get a couple of decent shots. The first one is the aftermath of the strawberry hitting the saucer and bouncing back up in the air. I really like it apart from the off putting shadow from the strawberry in the left of the saucer. The next shot couldn’t really have worked out any better than it did. I dropped two strawberries, one very quickly after another, into a glass bowl filled with cream. 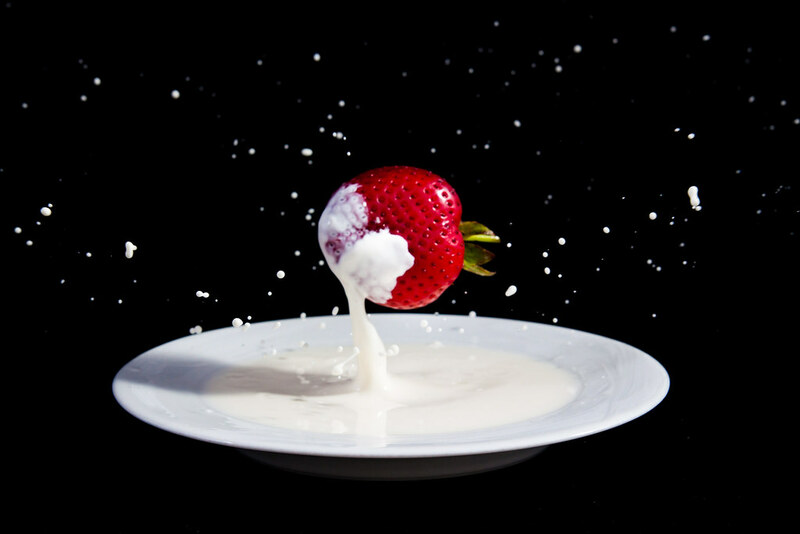 I was really pleased that I managed to not only capture the splash from the first strawberry but also the second strawberry following closely behind suspended in the air. This second photo therefore becomes the photo for week 12 of my 52 challenge and becomes my entry to the View 52 group on flickr. Below shows the set-up for the shot. If you click on the photo you can see more details about the set-up on flickr. I have set up lots of notes on the photo in flickr, simply hover your cursor over the photo once in flickr to read the notes.